The music industry is relaunching its gold, silver and platinum disc awards – with a twist. A new bronze disc will be awarded to “breakthrough” artists the first time one of their albums sells 30,000 units. The BPI, which represents the industry, said the award would benefit independent artists at the start of their career. The move reflects falling album sales in the streaming era, where fans are more likely to listen to single tracks. Gold, silver and platinum discs were first handed out by the music industry in 1973 – although music magazine Disc and Music Echo has been presenting its own gold discs to popular artists since the 1960s. Among the very first singles to be BPI certified were Slade’s Skweeze Me, Pleeze Me, The Rolling Stones’ Angie, and Sorrow by David Bowie. Elton John’s Goodbye Yellow Brick Road was the first album to be awarded a gold disc on 1 October 1973. 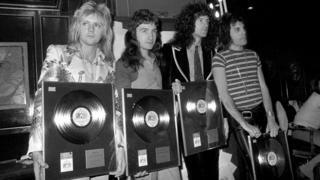 Since then, more than 14,000 artists have received one of the coveted awards, with Queen’s Greatest Hits album getting the greatest number of accolades – 20 platinum discs, representing six million sales. However, albums have suffered a dramatic decline in popularity since Queen’s collection hit the shelves in 1981. Last year 135 million albums were sold – a figure that includes stream-equivalent albums, where 1,000 streams count as one “sale” – down from a peak of 164 million in 2004. As a result, more singles are achieving sales awards. Alongside the introduction of the new bronze disc, the whole certification system is being rebranded. The discs will now be known as Brit-certified awards, linking sales certifications to the industry’s annual award show. Among the first singles to qualify for a Brit-certified award are Stormzy’s Blinded By Your Grace Part 2 (which goes platinum), Camila Cabello’s Never Be the Same (gold), and George Ezra’s Paradise (silver). The Weeknd’s 2016 release Starboy is the first album to receive a Brit-certified platinum disc.